St. Valentine’s Day is a sweet day. Yes, it’s sweet in two contexts. 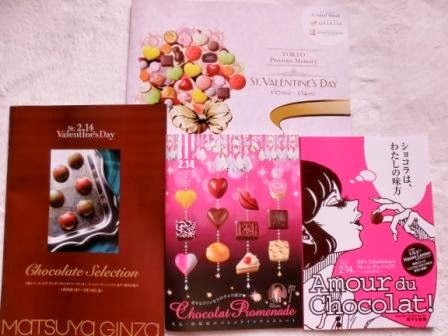 First of all, see these chocolate catalogues I collected in Tokyo. Actually, I have more catalogues of local shopping centres. Those four are big department stores’. Each of them has 25 – 50 pages, full-colored. Famous chocolatiers gather in Tokyo from the world. Why chocolate? Why did Japanese Valentine’s Day become like this? St. Valentine’s original legend is as following. In ancient Rome, it was forbidden that young soldiers marry. But St. Valentine secretly celebrated weddings for couples loving each other. Later it came to light and he was executed. It’s a legend, so nobody knows the exact fact. But it is true that Valentine’s Day is romantic for couples. There are few Christians in Japan. Valentine’s Day used to be celebrated by international people living in Japan, exchanging greeting cards, flowers, and sweets. Then, after World War 2, Japanese leading confectionery companies tried to make it their business chance. For marketing, they defined Valentine’s Day as “the day girls confess love to boys by giving chocolates.” It took some time but their marketing was successful. Valentine’s Day became popular among girls, especially students. In offices and families, women gave men “non-love-confession chocolates”. If you have seen some mangas and animes, you might have seen episodes like this in them. Girls are excited waiting for Valentine’s Day and boys are nervous wondering if some girl(s) come(s) to them. (And some boys hate Valentine’s Day because no girl comes…) This is why. However, it doesn’t happen very often these days. Why?